My alarm chirped at 5:30am. I made coffee; dressed in yesterday’s clothes; snacked on a Clif bar and drove out of the Holiday Inn parking lot at 6:00am. By the time I exited Des Moines, I had driven the interstate through urban, rural and highway construction areas across Colorado, Nebraska and Iowa – all with varying speed limits. I have always had an irrational fear of being pulled over by a policeman, so I adhere to the speed limit. Sort of. Heading east out of Des Moines, the posted limit was 70mph. I set my cruise control at 77mph. Conventional wisdom says 5mph is the maximum “over-the-limit” to avoid being stopped by the speed cops, but it was 6am with virtually no traffic, and I was headed to see Dad. Suddenly – the sky pitch black – flashing red lights filled my rear view mirror as a car loomed behind me. A man in uniform approached the passenger side of my car. I lowered my window just enough to see half his face and hear him speak. He bent towards the window and flashed his light at me. Me: “Yes” (in process of retrieving them). Yes, I should have driven to a lighted area or a mile marker or asked for his ID card and called 911. That’s what you always hear on the safety messages. Have you been in my situation? When the flashing red lights came up behind me, was I supposed to keep driving and trust that the person behind me knew I was driving to a lighted area and not trying to escape? When he came up to the window wearing a gun, was I supposed to ask him if he minded waiting while I – uh – called the cops? When he instructed me to come back to his car, was I supposed to refuse when he was the one with the gun? I admire and appreciate our police. I trust them. I want them out catching bad guys. And I don’t want to be prey to a bad guy pretending to be a cop. I couldn’t think fast enough, and I was very scared. I prayed he was a real cop and this would have a happy ending – not me dead in a shallow grave. When I entered his car, I saw a computer on the arm rest between the seats. 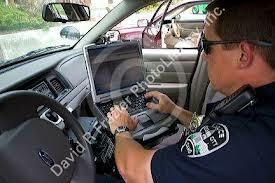 He typed information from my license and registration. We waited a few minutes during which he asked me where I was going. I explained about Dad. Finally the computer spit out a therma-fax printed paper. I was still holding my breath, not knowing whether this was on the up and up or some kind of scam. He finally explained the I-80 interstate is THE MAJOR drug corridor for drugs that come across the Mexican border into Texas and Arizona. The drug traffickers outfit unadorned cars and minivans with tinted windows and California or Colorado license plates. They drive the drugs north to I-80 then east for delivery in Chicago and Detroit, trying to stay ‘under the radar’. My bland car with tinted windows and Colorado plates fit the criteria. I had been profiled as a drug runner! OMGRIEF! Thump thump thump goes my heart! Can’t wait for the next episode! I too would have been very scared … but good on the cop for doing his job. 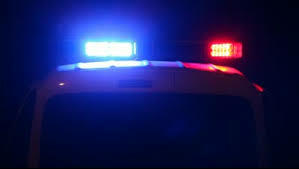 i know many cops, have worked with some on task forces and gone on ride-alongs. They have extremely difficult and dangerous jobs. It makes me ill every time there is one bad apple or obvious brutality incident because it ‘colors’ every one of them in the public eye, most who want to do the right thing for the public and their own safety. omg! Well done for staying calm, I would have been a gibbering wreck, lol. No I have not been in this situation and I pray to never be! Holy Toledo! Yeah, i always wondered about that, too! But my windows were definitely not what you’d call heavy tint, and how could he even see the degree of tint when it was dark outside? Early morning, dark, start of journey, all worst times to get pulled over. I could feel your fear. There’s a real basis for that. A friend told me that in Georgia, unmarked cars aren’t allow to make traffic stops to help people realize that cops are cops. I guess the logic is that if someone is driving around in a marked car (but isn’t a cop) they will get pulled over. In any case, you probably should have done one of the things you thought of later. I’m glad that worked out. The part that almost never happens to me was the “I’m not going to give you a ticket” part. That’s a good protocol on Georgia. But when they pull up out of nowhere behind you, you can’t even tell if it’s a marked or unmarked car. Because these types of things put me into a fog of paralyzing fear, I need to practice responses. Now I think – on a highway – i would instinctively put on my blinker (to acknowledge him) and drive to the next mile marker to call 911. I can’t practice the 911 call so I sure hope those cell calls get answered in the middle of nowhere! I’ve had many thought about this because in Oregon I keep seeing “cops” pulling over folks and they are in unmarked trucks and suvs. I would not get out for them. I would not trust them. Anyone can get a uniform, and yet, with the stunts the police have been pulling everywhere it is a tad frightening. Like you, I have never been afraid of them and respected them but not so much anymore. And yet, what do you do — I would want to see their badge and call 911. Is Oregon the other ‘legal marijuana’ state? I wonder if that (or gang activity?) has someting to do with number of unmarked cars ( altho’ that doesn’t iccur here in CO unless it’s gang-related In Denver area). I get so dismayed when officers go outside the lines on breaking the law themselves or using brutality or borderline aggressive tactics. It puts ‘the goid guys’ in much more dangerous positions and makes public – as you say – mistrustful of our first line of orotection as citizens. I think the “every cop wear a camera” is good policy for all if us. No legal pot here — Washington, a stones throw, is for medical marijuana. NO, they just seem to lose it. I don’t get it — I had sheriffs in my family and was fine with cops but now — yikes. Don’t you feel that way -yikes – about almost all institutions? Education, hospitals, gov’t depts. seems like firefighters are last competents standing! Oh wow, I don’t blame you for being scared. I’ve always wondered what I would do in that situation. Would I be brave enough to ask him to let me call to confirm he was an officer? I hope so, but I don’t know. Our assertiveness can disintegrate in the shadow of authority. I know I wouldn’t be brave enough to keep driving to a lighted area. I’d worry I’d tick him off. Then again, since it’s the police who recommend these safety precautions, you think they’d understand. I’ll be visiting my niece next month. She’s a cop so I’m going to ask her about this. I’ll be interested to see what your niece recommends. Read Melinda’s comment. Yikes !!! I just read it. Yikes indeed! “I should have driven to a lighted area or a mile marker or asked for his ID card and called 911. That’s what you always hear on the safety messages. Yes, I’ve been in that situation. I was alone in my car at 11:00 at night, having just dropped my son off at a friend’s house for a sleepover, and was heading for home, when for no reason I could think of, the dreaded flashing lights went on behind me. I wasn’t speeding, and there was no other traffic, so I knew I hadn’t cut anyone off or anything. So yeah, I was pretty nervous. Like you, I have a completely irrational fear of cops. As we were in a construction zone where there was nowhere to pull over except in the single traffic lane, I continued to the first exit–about a mile, and man, a mile is a lot farther than you think it is–and pulled into a gas station parking lot with the police car still behind me. I stopped my car, put it in park, turned it off, and waited for the cop to come to my window. He didn’t. I looked in the side-view mirror to see what was taking so long, and saw him standing foursquare in classic cop-show fashion behind the open door of the police cruiser, gun drawn and held in both hands and pointed at me. He asked me over the PA to kindly step out of my vehicle and keep my hands where he could see them. My reaction was like yours. WHAT? WHAT?? WHAT??? Everyone in the gas station (which was apparently a local hangout) came out to see the criminal who had been apprehended. It all got cleared up, of course. My felony? One of my headlights was out. OMG, Melinda – no wonder I didn’t want to follow the so-called safety options. I am so sorry that happened to you! I do think cops take their life in their hands with every stop these days, and I can’t imagine their daily fear as well. But still, how awful for you. Holy Crap!!! … that is a REALLY scary story. I probably would have needed to change my underwear after that stop! Read Melinda’s comment. It’s even scarier! I did read it and it’s not funny having a gun pointed at you!! I can completely understand his need to protect himself but Holy Crap!!! We’ve had a slew of ambushed and slain cops at traffic stops; it’s such a dangerous job balancing interactions with life-threatening criminals and innocent people. It’s crazy that the minute that light comes on behind us that we forget all the rational advice we have been given to drive to a well lit place before you pull over….I would have been peeing in my pants!! I’m kind of glad I’m not the only one who freezes like that. I still don’t know why I’m so afraid because I’ve had plenty of good interactions with police! If you really want a scare, read Melinda’s comment. Oh, my lord, how scary. And crazy — the window tint? Had no idea that’s an issue in other states. We, Californians, with all the sun in the world barring on us, have tinted windows everywhere. A little tint never hurt anyone. I guess they have this issue about being able to see inside your car very well, without obstruction. My goodness! Yes, we have the full sun too. But my tint is not that dark!! Scary stuff whether you’re the druiver or the cop. Far too many of them are killed in the line of duty. That’s really scary. There really are too many stories of “fake” cops out there. I once got blocked into a parking place at REI and threatened by an “off duty” cop for what he said was “aggressive driving” (apparently I passed him on the highway…) and he followed me for 5 miles to yell profanities at me while trapping my car in a parking lot. I lowered my window just one centimeter to get his “business card” because he had no cop car, no uniform, and no badge! I called a lawyer and his precinct afterwards and I think he got in a heap of trouble. Best $100 I ever spent, on that lawyer! Oh my gosh, Kelli. That is really frightening . He clearly had some anger issues; I wonder if he lasted on the police force. Good for you for following up. I hope he didn’t last. Truly, most police are outstanding individuals doing a really hard job, it’s just every once in a while there are those who are simply attracted to the position of power, I think! Good grief! What a scary story. And very well told. I’ve only been pulled over once, and it was for a headlight out. I always worry about fake police, too. I can’t help it. The way things are today, you never know. Yeah – risky business for civilians, but the real cops have a lot of risk too. Bad guys make it dangerous for everyone.